In power systems, the balance between generation and consumption must be maintained continuously. The essential parameter in controlling the energy balance in the system is system frequency. If generation exceeds consumption, the frequency rises and if consumption exceeds generation, the frequency falls. As shown in Figure H.1, power system operation covers several timescales, ranging from seconds to days. Ultimately, it is the responsibility of the system operator to ensure that the power balance is maintained at all times. To start with, the primary reserve is activated automatically by frequency fluctuations. Generators on primary control respond rapidly, typically within 30–60 seconds. Imbalances may occur due to the tripping of a thermal unit or the sudden disconnection of a significant load. An immediate response from primary control is required to reinstate the power balance, so that the system frequency becomes stable again. For this near-immediate response to power imbalances, adequate generation reserves must be available from generation units in operation. The secondary reserve is activated either manually or automatically, within 10 to 15 minutes following frequency deviation from nominal frequency. It backs up the primary reserve and stays operational until long-term reserves take over, as illustrated in Figure H.2. 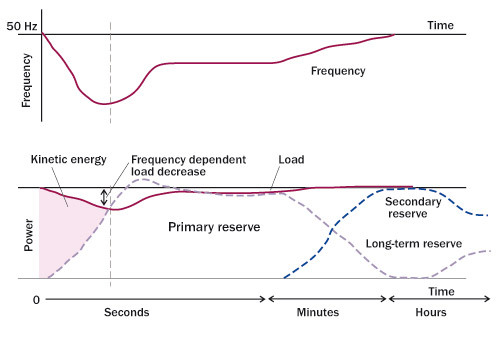 Figure H.2: Activation of Power Reserves and Frequency of Power System as a Function of Time when a large Power Plant is Disconnected from the Power System. The secondary reserve consists of a spinning reserve (hydro or thermal plants in part-load operation) and a standing reserve (rapidly starting gas turbine power plants and load shedding). 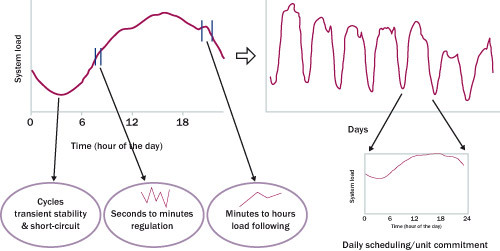 Since changes in loads and generation, which result in a power imbalance, are not predictable or scheduled in advance, primary and secondary controls operate continuously, to ensure that system frequency remains close to its nominal value. Electrical power consumption varies by the minute, hour and day. As the power balance must be continuously maintained, generation is scheduled to match the longer-term variations. Such economic dispatch decisions are made in response to anticipated trends in demand (while primary and secondary control continues to respond to unexpected imbalances). For example, an increase in load usually occurs from around 7.00 am to midday, or early afternoon. After the daily peak is reached, the load typically falls over the next few hours, finally reaching a daily minimum late at night. Some generators require several hours to get started and synchronised to the grid, which means that the generation available for the midday peak must have been initiated hours in advance, in anticipation of this peak. In many cases, the shutdown process is also lengthy, and units may require several hours of cooling prior to restarting. The decision to use this type of unit often means that it must run for several days, prior to shutting down, in order to be economically viable. This timescale is called ‘unit commitment’, and it can range from several hours to several days, depending on specific generator characteristics and operational practice. During operational hours, the balancing task is usually taken over from individual power producers by the system operator. This is cost-effective, as the deviations of individual producers and loads equal out when aggregated, and only the net imbalances in the system area need to be balanced to control the frequency. System operators have the information on schedules for production, consumption and interconnector usage. They either draw up these schedules themselves or obtain them from the electricity market or other parties involved (producers, balance responsible players or programme responsible parties) and they may also use online data and forecasts of load and wind power to assist in their operational duties. During operational hours, they follow the power system operation and call producers that have generators or loads as reserves, which can be activated depending on the need to balance power system net imbalances.